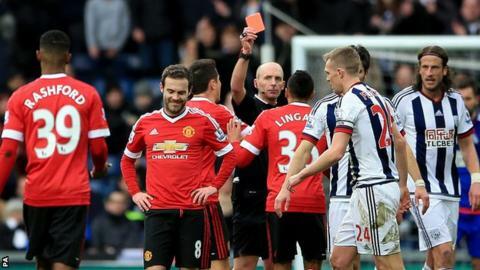 Manchester United midfielder Juan Mata says he takes responsibility for his 26th-minute red card during Sunday's 1-0 defeat at West Brom. The Spain international was dismissed after being awarded two yellow cards in three minutes at The Hawthorns. He was booked first for stopping a quick free-kick and then carded again for tripping Albion's Darren Fletcher. "I could have avoided them and I take responsibility," said Mata, who will now miss Sunday's FA Cup quarter-final. United face West Ham at Old Trafford. Writing on kicca.com, Mata said the red card was his first in almost 500 games as a professional. "The truth is this is a new and strange situation for me, not easy to assimilate, but we learn from everything," he said. "I know that, in football, we see things like these every week, but obviously what hurts more is that my team-mates had to fight with 10 men for a long time." Mata said both decisions by referee Mike Dean were "rigorous". He added: "In many occasions, we see more serious fouls that are not penalised in such a way, but at the same time I could have avoided them and I take responsibility. "It also leaves me with a bad taste for the supporters who travelled to the stadium and for those who were watching the game from home. "What matters is to move forward and to always learn from each situation. And so I will. "I hope this blot won't make us forget that we were on the right track and that we have to keep believing in ourselves to achieve the goals that are still in our minds from now until the end of the season." Manager Louis van Gaal was critical of both Mata and Dean after Sunday's dismissal. He called Mata's first booking "stupid" but felt Dean should have shown more leniency when booking Mata for tripping Fletcher. "The referee has to know the person who makes the tackle," the Dutchman said. "Mata never hurts an opponent." It took West Brom until the 66th minute to score the winner. Salomon Rondon found the net with a left-foot shot from substitute Sebastien Pocognoli's dangerous first-time cross from the left wing. "I don't want to say that we deserved to win, no, but we don't deserve to lose," Van Gaal said. "When you see at the end the chances that West Bromwich Albion has created in comparison with us, it was an unnecessary loss." Van Gaal hopes the loss does not impact negatively on United before Thursday's Europa League trip to Liverpool and Sunday's FA Cup tie against West Ham. "I think always this match has an influence on the next match so it is, for us, very bad," he said.